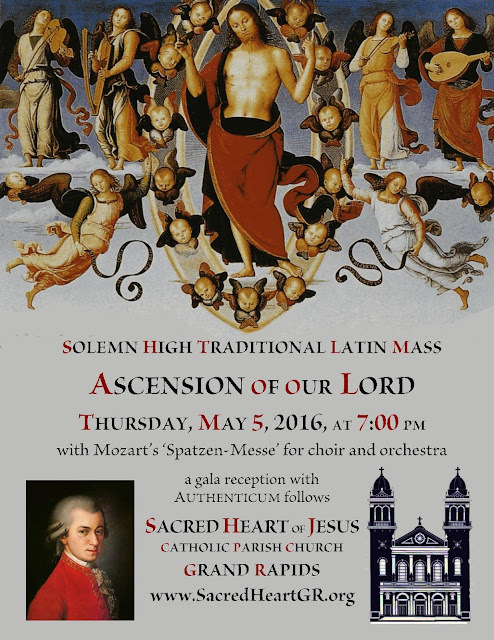 The parish of the Sacred Heart of Jesus, in Grand Rapids, Michigan, located at 156 Valley Avenue, will celebrate a Solemn High Mass in the Extraordinary Form for on Ascension Thursday, May 5, 2016, at 7:00 pm. The celebrant will be Father Robert Sirico, the pastor of the church; Father Jason Catania of the Ordinariate of the Chair of Saint Peter will be the liturgical deacon. Music for the Mass will include Mozart’s ‘Spatzen-Messe’ with orchestra; a reception sponsored by the ‘Authenticum’ lecture series follows.